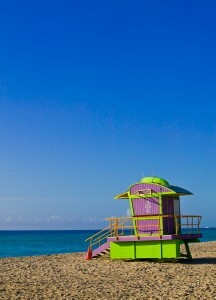 Here’s a project Julia and I started last year: take a picture of all the Miami Beach Huts. Shame neither money nor time allows us to go back this year and finish the series, but it’s on the backburner. Here’s what we have so far, all the beach huts from South Pointe to 15th Street. I was inspired by these little pieces of art ever since I came to Miami back in 2001, and I always wanted to do this. Since then, the character of South Beach has chanegd dramatically, and it won’t stop there. South Beach is like Las Vegas: everything changes all the time. Gone is the slightly seedy character from 10 years ago, and in move the super rich (or those who pretend to be). Soon there will be the point where you won’t be able to buy a cup of coffee for less than $10. Meanwhile, the Beach Huts have been the same. They stand the test of time and are the real Art Deco. Each of them an individual, and here’s hoping they’ll stay just the same.